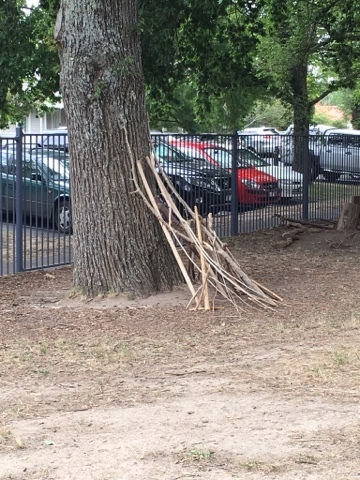 I posted previously about finding a copy of Bush Bandits and creating a literature unit for it for next year. recently I emailed the illustrator and got a terrific reply. Thank you for sending me a copy of the The Bush Bandits unit. 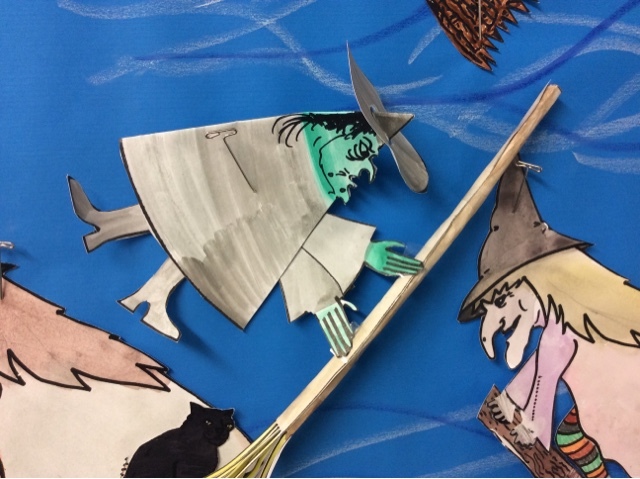 I am very impressed by it and am moved that you and the students enjoyed the book so much. 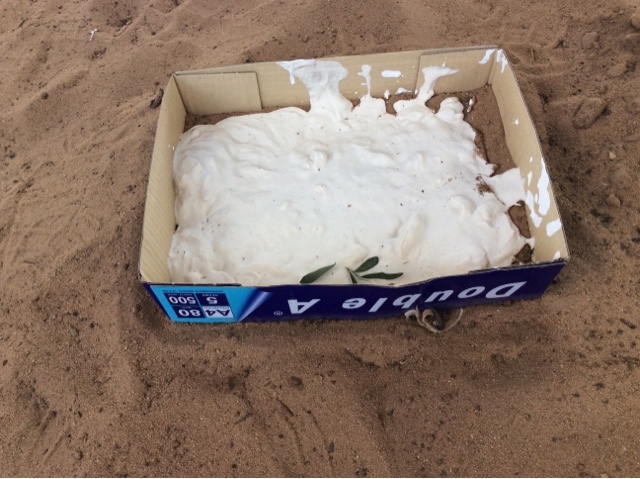 It looks like you have put in a lot of effort into the unit with all of the different activities. You did a good job with the illustrations as well. 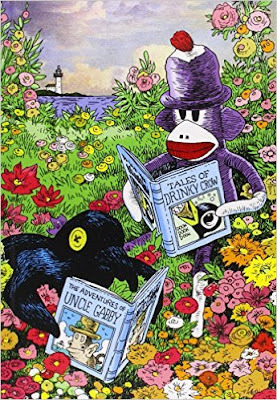 I was 19 when I did the illustrations myself and i did work with Betty on the book, I think I met her in Sydney at the time. I appreciate the blurb you wrote on me too. I still have a copy of The Min Min, it won children's book of the year that year. I am still drawing when the need arises such as for portraits etc. I would love to stay in touch in regards to any future developments. You sound like you really appreciate and have a sound knowledge of Australian literature and that is quite refreshing. 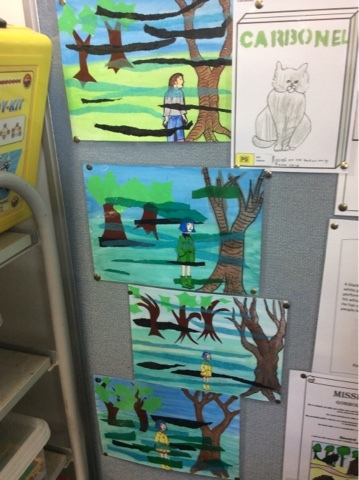 Find attached a copy of my literature unit for grade 5-6 of The Bush Bandits. I went to a church book sale last week and found a copy of The Min Min but no illustrations in it and no acknowledgement of the cover artist. I will read The Bush Bandits as a serial and we will work on it as part of an Australian theme that I start the year with, I might add the Min Min too. I hope you are fit and well and enjoying your art. Thank you for your email. In response to your question, I am the illustrator of Betty Roland's Bush Bandits. My maiden name is Melrose. Do you have an interest in the illustrations? If you want to ask any questions about this then feel free to email me. 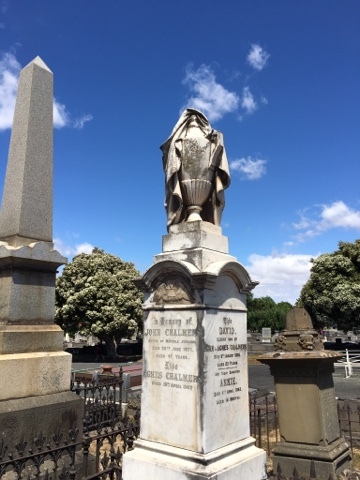 Today I took the grade 5s to the old Ballarat Cemetery to look up old relatives ( no luck there) and to also go for an explore. 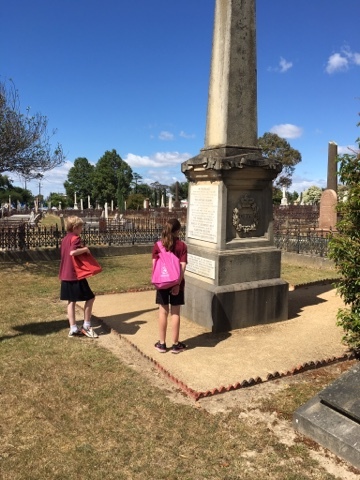 ( Like Coraline) We found the 2 Eureka Rebellion monuments ( to the miners and the soldiers) and we also explored the Chinese and Jewish sections. 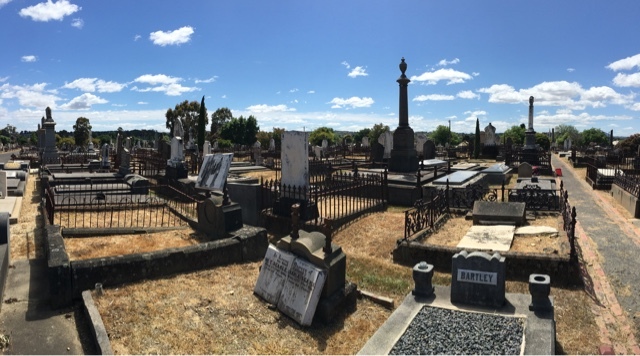 We found a few prominate early settlers and lots of diggers and sadly dead babies and infants. 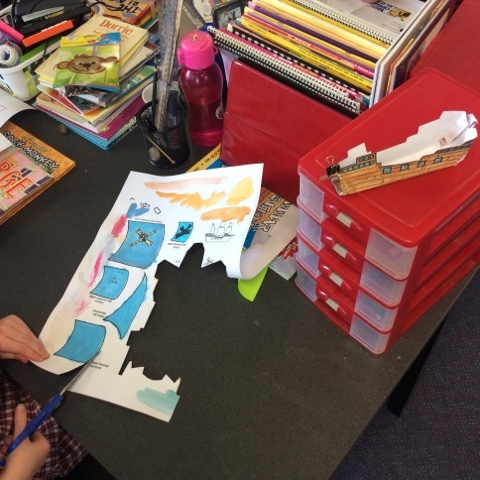 We spent some time researching, sketching and taking photos with our iPads. 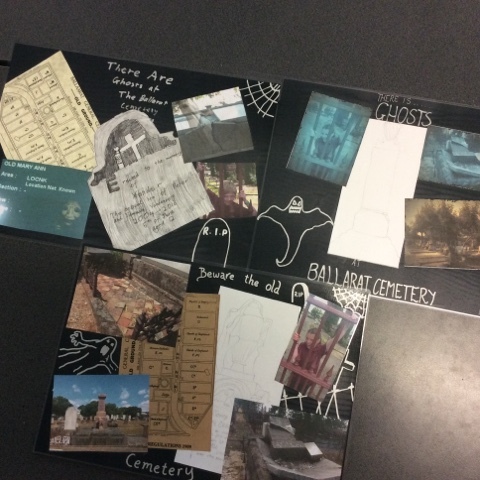 When we got back to school we created a collage about our visit. Temple in the Chinese section. 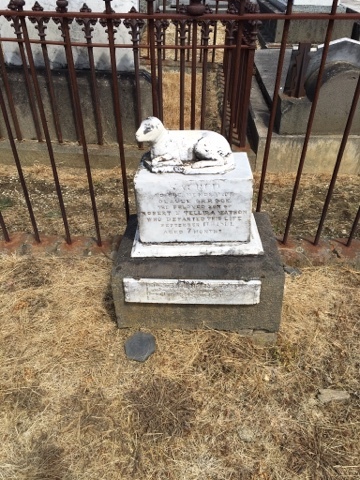 'Lost lamb' a child's grave. 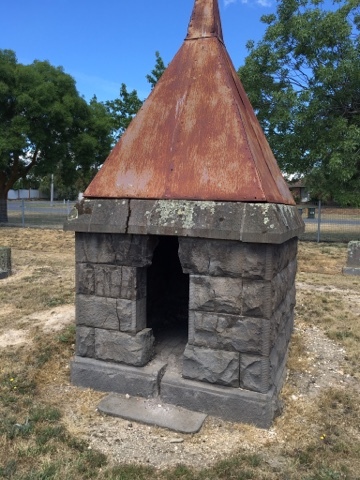 The shrouded urn, a popular monument in the cemetery. 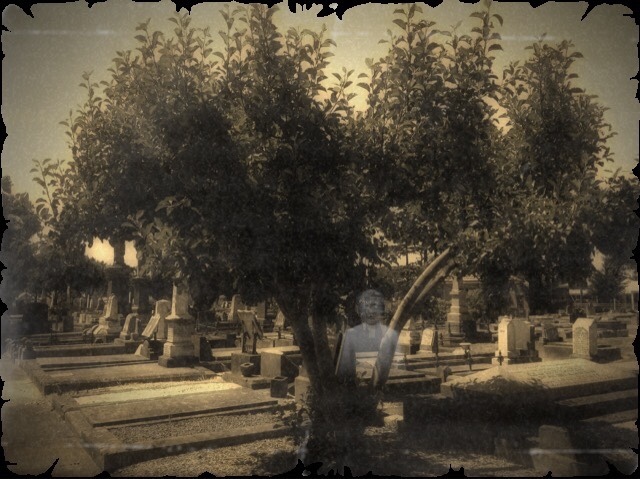 The kids played around with some of their photos on their iPads when they got back to school. 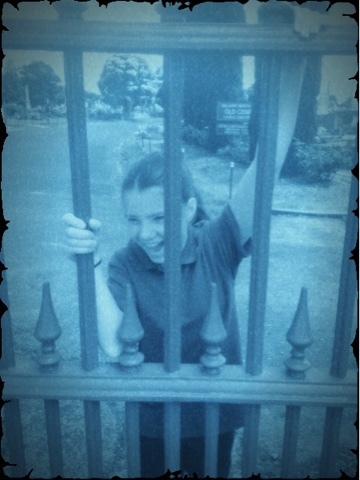 Ahhhhh trapped in the cemetery! 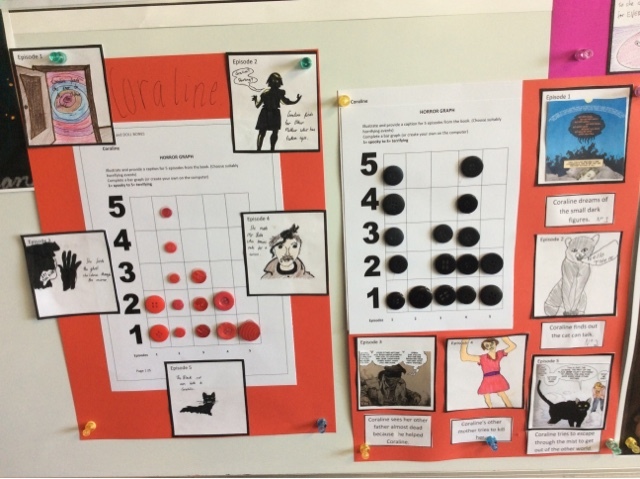 Today the grade 5s completed character traits charts for Coraline ( I think they unanimously agreed that she was brave and resourceful. ) 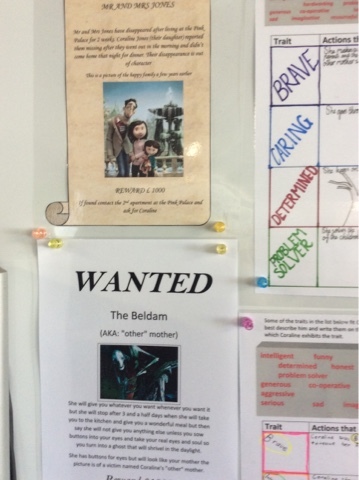 and finished missing persons or wanted posters. They also completed their Horror Graphs. Tomorrow we will start work on Doll Bones. 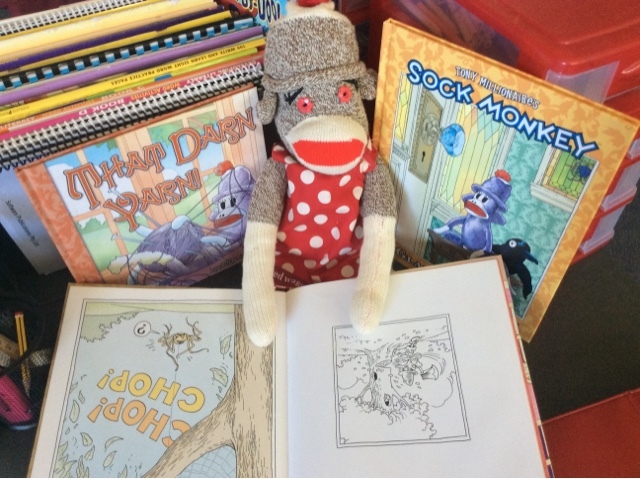 At the moment my grade 2 child is working on Tony Millionaire's Sock Monkey books: That Darn Yarn, Little and Large and The Glass Doorknob. 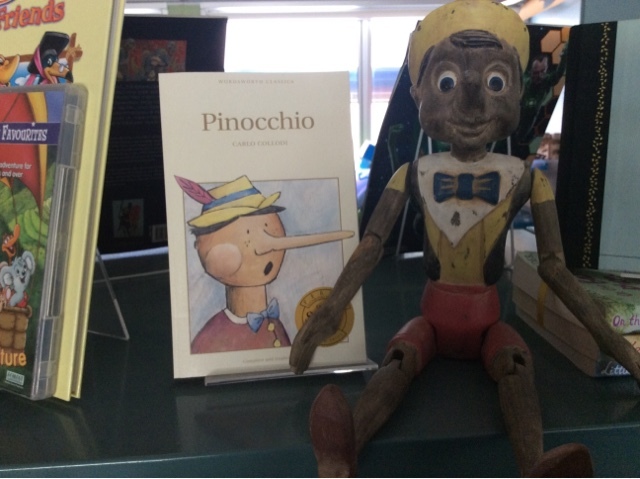 I was also going to post Pinocchio but I will do a bit more with that this week and post it next weekend. 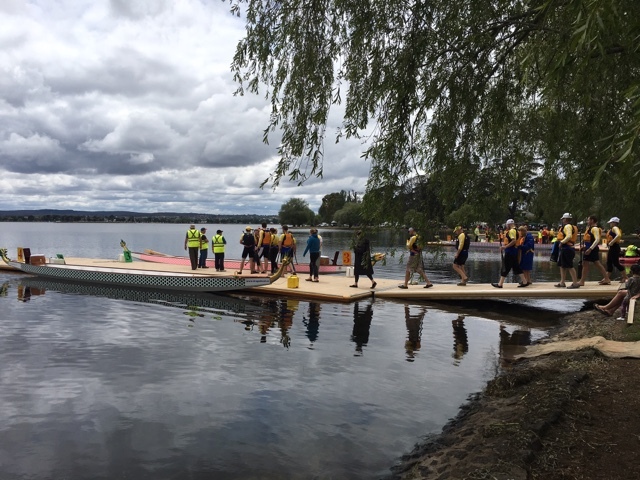 Springfest around Lake Wendouree today. I like to have a look at the restored and vintage cars. 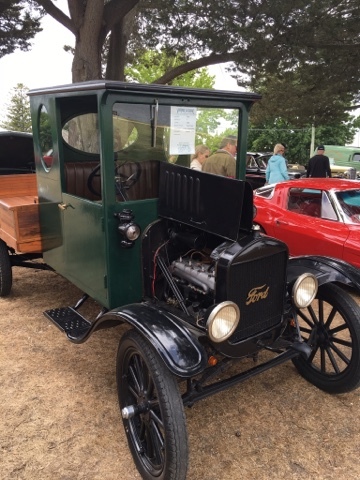 They had a great model T delivery van, the type my father used to drive around Sydney as a 14 year old (yep that's right...the good old days! )in the 30s. I walked right around but I think it best if I refrain from commenting further. George Bernard Shaw once described golf as a good walk ruined....Springfest is for me anyway, much the same. 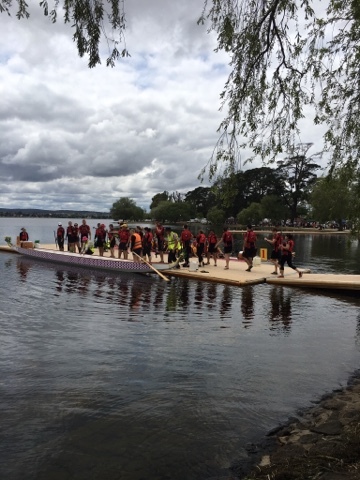 Dragon boats took to the water. 1. Investing more in public education, including $610 million in new school buildings and upgrades. 2. 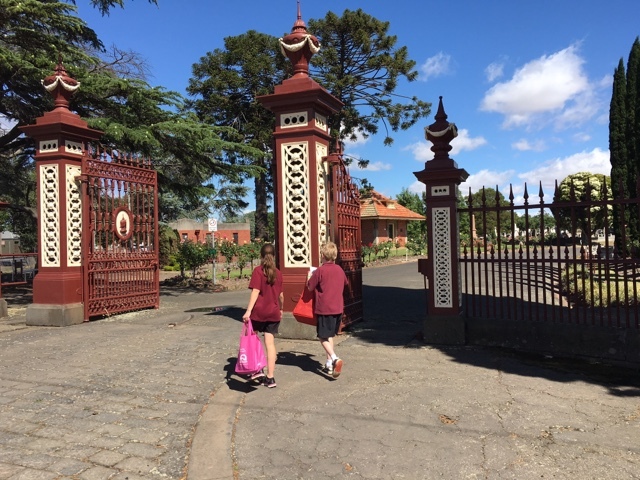 Commissioning the Schools Funding Review led by former Premier, the Hon Steve Bracks AC, to examine future funding arrangements for schooling in Victoria. The recommendations from this review will form the foundations for public education into the future. 3. Removing religious instruction from our public schools to make way for a more inclusive curriculum on respectful relationships, different cultures and ethics. 4. Delivering the first real allocation of Gonski needs-based funding to our public schools – a $160m investment for 2016. 1. Guaranteeing private and independent schools at least 25% of the money public schools receive. This is against the very notion of needs-based funding which means public funding should be allocated on the basis of student need, regardless of the sector. 2. Reluctant to commit to Gonski needs-based funding for the final two years of the agreement between the Federal and State Governments; 2018 and 2019. Without long-term commitment our schools will find it hard to implement programs for our kids. 3. Victorian public schools students are still the lowest-funded in the country for education, with every Victorian student $1,836 worse off than the national average. The Andrews Government has made a positive start but there’s still a lot of work for them to do! 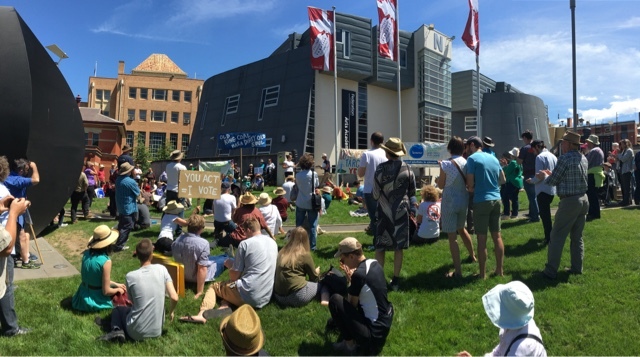 Climate Action March in Ballarat photos. 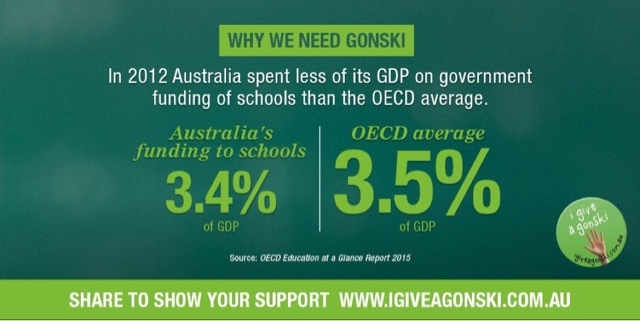 Give a Gonski- 2 more stories about the school funding crisis. One thing you discover when you become a parent is that small children are real suckers. When my son was two, my husband had to restrain me from telling him that if he didn't eat his vegetables, his arms would fall off. "But he'll really believe you!" my alarmed husband insisted. "Precisely the point", I replied, as I tried to spoon steamed broccoli into his stubbornly closed mouth. Children are prone to believing such things because they're still figuring out how the world works. When I was a kid, I understood citizen's arrest to be a real thing, and was constantly threatening my recalcitrant friends with incarceration. It was also generally agreed in my social group that doing too much karate could stifle your travel plans, for your hands would have to be registered as lethal weapons before you could enter the United States. I also believed, as did many of my Catholic peers, that using a tampon would deflower me. My friend Ann was convinced that riding a bicycle while in bathers was illegal, and that anyone caught in charge of a pushbike while so attired risked immediate arrest – probably by an irate citizen. Think too hard about these myths and even a child will realise that they can't be true. But they're also kind of exciting and titillating, so most kids prefer to just accept them. Which is why they're so durable. The same is true of many adult myths. My favourite, which is accepted by a remarkably high number of grown-up Australians, is that elite private schools are entitled to all the bells and whistles they enjoy because parents have paid for them. This quickly falls apart if you think about it. Private schools receive huge sums of money from the public purse; very nearly as much money as government schools. If that money was being used to keep struggling private schools afloat, then it might be justified. But in many cases it is in fact used to fund the educational "excellence" that we hear about in private school advertising campaigns – state-of-the-art sports grounds, pools, outstanding facilities of every kind. 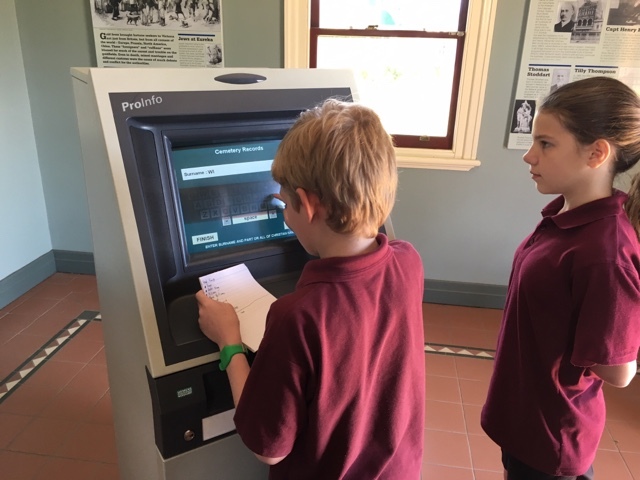 As commentator Jane Caro recently observed, one school is now providing on-site baristas, subsidised by our taxes. The myth that underpins this – that parents are simply making a choice, and are themselves funding that choice – serves to obscure the gross inequality at the heart of our education system. The implication is that parents who send their kids to state schools should stop complaining about the under-resourced, overcrowded public system because they have chosen it. They weren't willing to pay, so their kids deserve what they get. As a teenager I was acutely aware of this divide. It was first pointed out to me in grade 6, when one of my classmates informed me that the high school I'd be attending was a "dog school", the crap Catholic school where no one really wanted to send their kids. She, on the other hand, was going to the superior private school with hats, pressed uniforms and various state-of-the-art facilities. Naturally, I was upset by the revelation that my school was for canines, as I'd naively assumed that my parents had chosen to send me there because it was closer to our home. But my classmate's spitefulness put me in my place, reminding me where I was from and what my parents could afford. I don't know whether my nasty classmate got a better education than I did, but I'm pretty sure she would have come away with a greater sense of entitlement, and the self-confidence that typically goes with it. For entitlement grows naturally out of the myth that justifies the system. Her parents paid for her superior education, made sacrifices to afford it, so she was entitled to the benefits that it brought her. Yet once you recognise that the taxpayer is footing a very substantial part of the bill, and that elite private schools are effectively siphoning away funds that could have gone into the state system, you see the equation very differently. Far from being entitled to anything, children who benefit from expensive private educations are in fact indebted to the ordinary taxpayers who subsidised their swimming complexes and their baristas. It's everyone else who made the sacrifice – sending their kids to underfunded state schools, while the private sector hogged the education dollar. As we grow older most of us stop believing in myths such as citizen's arrest. 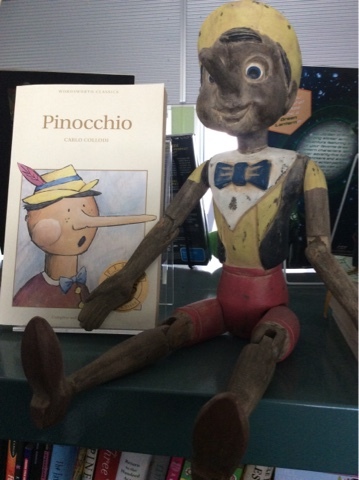 When will Australia grow up and see through the education myths that are doing a disservice to all our children? The average public school student could receive up to $100 less a year in state and federal government funding than a similar independent school student by 2020 without the final two years of Gonski reforms, a new report has revealed. The "Private school, public cost" report, due to be released on Friday by the former president of the NSW Secondary Principals Council, Chris Bonnor, and education researcher Bernie Shepherd, has found that state and federal government funding for nearly half of the nation's independent schools could outstrip public funding for the average public school within the next five years. The reports authors also found that public funding for up to 75 per cent of Catholic schools across the country would outstrip funding for similar public schools by 2016. Bonnor and Shepherd targeted their research at the average socio-educational ICSEA of 1000 to 1099. ICSEA measures the educational and occupational outcomes of a school's parents. It can range from a very disadvantaged school at 500 to a very advantaged school at 1300. ​Data drawn from the MySchool database shows that less-advantaged public schools are already receiving equal public funding compared to more advantaged independent schools. Rooty Hill High School, which educates more than 1000 students in Sydney's west, has a below average ICSEA of 958. It currently receives $10,469 in state and federal government funding per student. 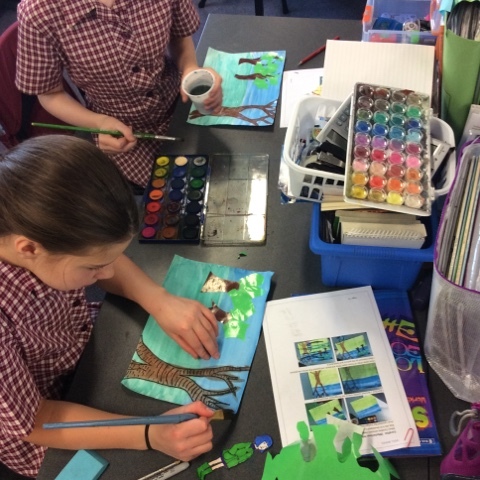 According to the report the median public school student will receive $11,350 in public funding by 2018, $380 less than the $11,720 for the median Catholic school student, while a similar independent student will receive $100 more than the comparable public school student by 2020. 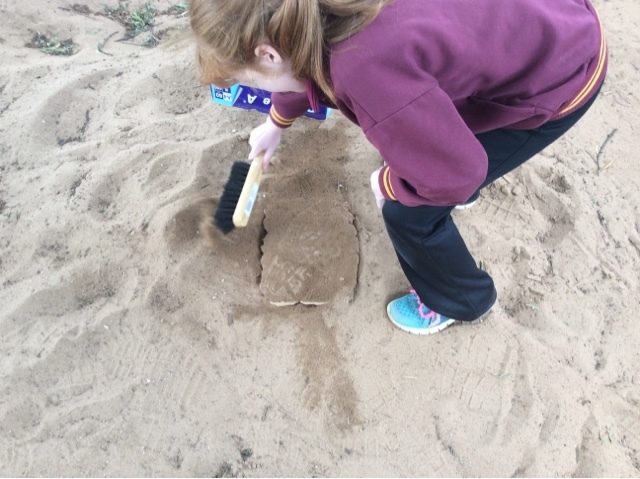 The report does not take into account potential funding changes under future governments and is based on the latest available MySchool funding data to 2013, which does not allow for changes under Gonski. The Association of Independent Schools said the report was misleading. 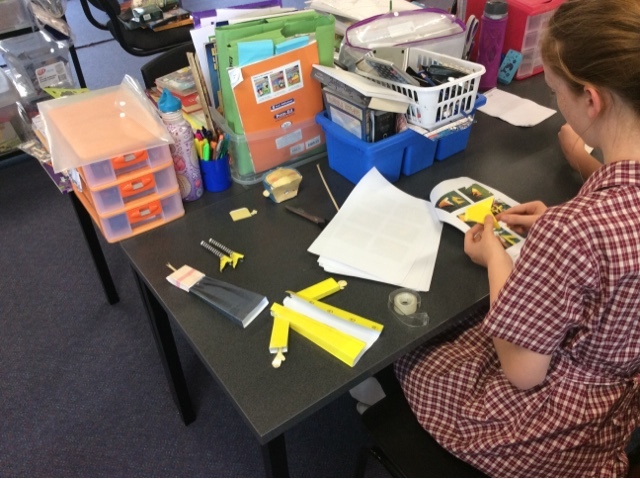 "The Productivity Commission has shown that government funding heavily favours students attending government schools, by a difference of almost $7000 per student. It's difficult to reconcile the outcome of this report with the reality of funding," said acting executive AIS director Michael Carr. 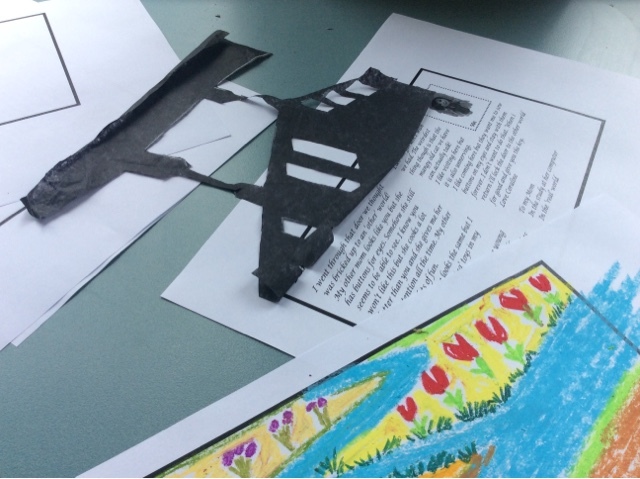 The Productivity Commission's figures take into account the value of a school's buildings as well as the high funding for special needs and very disadvantaged students in the public system, pushing up averages, according to Bonnor. "In reporting the relative costs and claimed efficiencies in each sector it is essential to compare schools that enrol similar students. It is the only way of comparing apples with apples," he said. The National Catholic Education Commission executive director Ross Fox echoed the Association of Independent Schools' concerns. The federal president of the Australian Education Union, Correna Haythorpe, called on the Abbott/ Turnbull government to join NSW and Victoria in providing the full six years of needs-based Gonski funding. "This [pre-Gonski funding] was clearly unfair," she said. "We have ended up with ridiculous situations where private schools with high-SES students were receiving more government funding than public schools with low-SES students," she said. It was a bit cool this morning but warming up now. 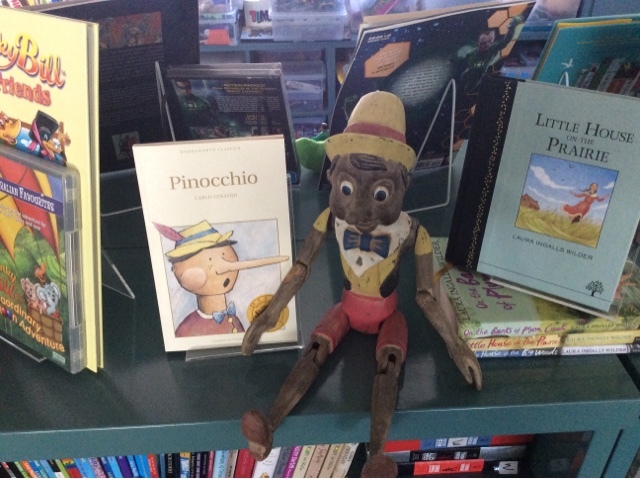 This morning I've finished my Tony Millionaire's Sock Monkey unit and a Pinocchio unit for grade 2 to go with it. 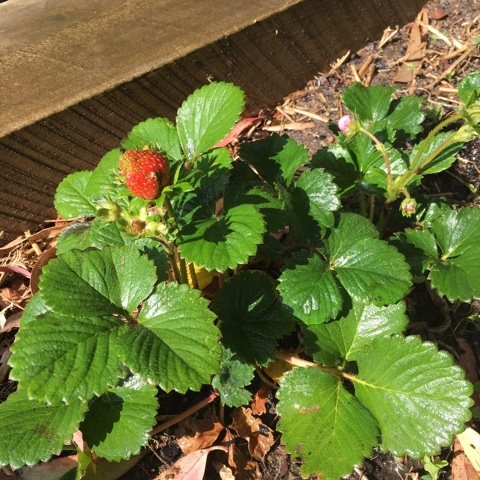 The cows were out and about this morning and we have our first summer strawberry! 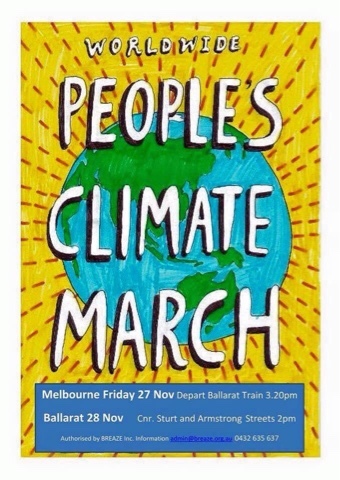 This afternoon...in fact in an hour I'm off to a climate change rally in Ballarat. 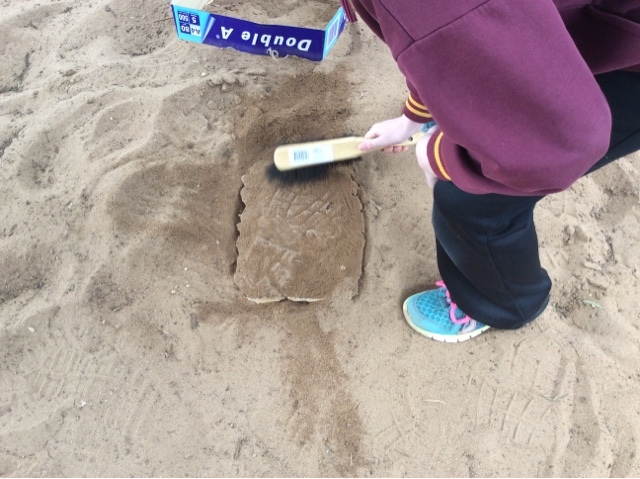 We removed the cast we made from the sandpit yesterday and it set well. This student will write a report about how she made the cast and how it turned out. 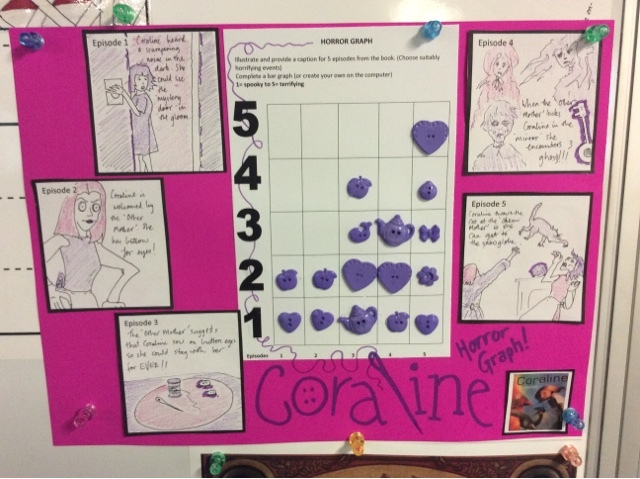 We finished our Coraline postcards this morning and our Horror Graphs. Private enterprise and education don't mix! With every new scandal the argument for opening public funding to for-profit providers has another nail hammered into it. 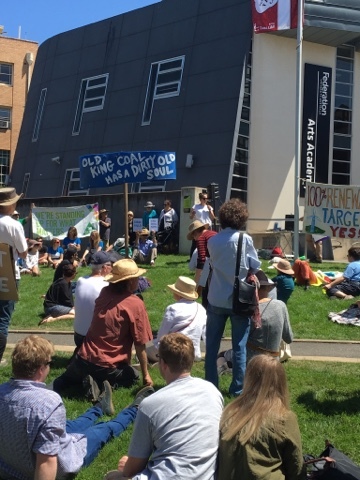 It’s time to bury this policy coffin, writes Ben Eltham. Another week, another scandal in vocational education. This time it was the news that the Australian Competition and Consumer Commission is investigating private college the Phoenix Institute. Phoenix is accused of signing up students to courses they don’t intend on studying in return for inducements like free laptops. The government forks out the cash via its FEE-HELP subsidies, and the college enrols the phantom student and makes off with the cash. The victims are the students conned by the scam. They get a government student debt that in many cases they will never repay, for a course they will never complete. The taxpayer foots the bill. The Phoenix Institute’s scam appears highly evolved. The ACCC alleges that Phoenix enrolled more than 9,000 students to FEE-HELP Diploma courses, costing them between $18,000 and $21,000 per course. The tactics included aggressive door-to-door sales. Such was the scale of the dishonesty, most students were enrolled in double-diplomas, allowing Phoenix to effectively double up on the amount it gouged from the taxpayer. That scam is costing the Treasury hundreds of millions, perhaps billions. Phoenix appears to have taken as much as $106 million from the federal government in 2015 alone, according to the ACCC. Phoenix is far from alone. Tales of shonky colleges abound, many of them uncovered by Fairfax’s Michael Bachelard and Labor’s Kim Carr. Just this week The Age carried the story of a Melbourne job seeker offered a job as a “careers counsellor” at a Victorian education broker. Such is the demand from training organisations accessing FEE-HELP, government payments to the sector are doubling each year. A recent government Regulatory Impact Statement for FEE-HELP for the VET sector found that student loans rose from $699 million in 2013 to a whopping $1.76 billion in 2014 – an increase of 157 per cent. Sound familiar? Vocational education has become one of the biggest rorts in the nation. It’s been happening right under our noses. As early as 2012, New Matilda was reporting on the blow out in vocational funding in the Victorian state system, after John Brumby’s Labor government deregulated vocational education and training in 2010. The result was a free-for-all. Fly-by-night training colleges set themselves up to skim off state subsidies for dubious courses of little value. In one notorious example, enrolments in courses for fitness instructors blew out by 2000 per cent. Prominent policy expert Leesa Wheelahan called the Victorian reforms “a lesson in how not to reform vocational education.” But no-one was listening: under Julia Gillard, the federal government opened up vocational education and training to FEE-HELP loans. Current Federal Minister for Education Simon Birmingham. The Redfern Legal Centre told the Senate Inquiry that brokers for some providers were going door-to-door in public housing blocks, as well as targeting people on Centrelink. Another submission told of a group of pensioners at a shopping centre being signed up to diploma courses in return for free laptops. The rorts have ranged from obviously dubious outfits like Phoenix to superficially respectable listed corporations such as the now-defunct Vocation. Vocation was a slick corporate outfit chaired by former Labor luminary John Dawkins and run by charismatic businessman Mark Hutchinson. It grew rapidly, buying a swag of private colleges and registered training organisations, and gorging itself on FEE-HELP cash. Vocation’s business model had little to do with education, and everything to do with profit. 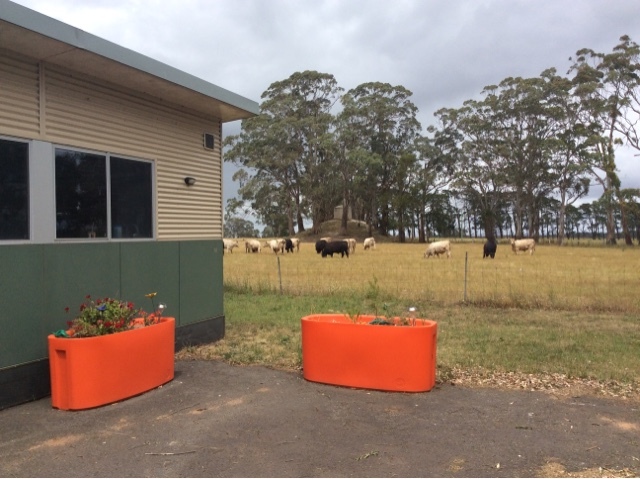 Public subsidies for training were booked as revenue, with courses delivered for less than the subsidy by subcontractors in a process known as “auspicing”. Auspicing allowed Vocation to grow its bottom line without the need to invest in costly classrooms, libraries, and teachers. The house of cards collapsed last year when the Victorian Department of Education started investigating Vocation’s educational standards. After an audit found that Vocation should repay $19 million in state subsidies the company’s share price cratered. There may be a few other people changing their careers entirely, however: Vocation’s managers and directors. The firm officially called in the administrators this week. It should be obvious what’s driving the vocational education fiasco: poor regulation. The Senate Inquiry found that the regulator, the Australian Skills Quality Agency, simply doesn’t have the legal powers and the financial resources to adequately monitor the sector. It’s hard to disagree. Regulating quality is difficult enough in the university sector, where there are only 39 institutions and relatively high standards of transparency. Even so, one in seven university students drop out. In comparison, the VET sector is a Darwinian jungle, with fly-by-night colleges gobbling each other up in an ever-changing merry-go-round of new logos and livery. If the regulator is only now catching up to shonks like Phoenix, what chance do prospective students have? The common thread behind the rampant rorting is privatisation. 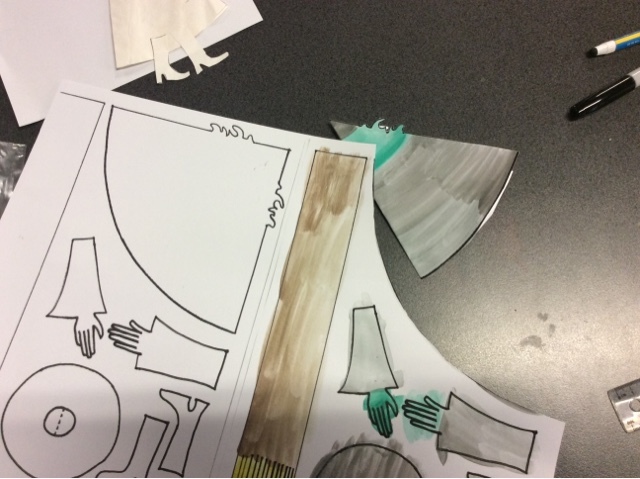 We’ve seen it in childcare, with ABC Learning, and we’re seeing it in the VET sector, with Phoenix and Vocation (and let’s not forget our old friends at the Whitehouse Institute of Design). Some goods and services are not very well suited to the free market. Education is a classic example. It is by nature a mixed public-private good, in which the benefits that accrue to individual students are balanced against the benefits to society as a whole. As a result, education quality is hard to measure, and difficult to regulate. Whenever human services are privatised, the risk of rorting is always present. And that’s exactly what’s happened in vocational education: while the sharks have walked away with millions, the taxpayer has been left to foot the bill. It should be a signal to anyone favouring further privatisation of our university system. But will the government listen? New Education Minister Simon Birmingham has a lot of homework to do. Postcard from the 'other' world from Coraline. On one type/ write a message from Coraline to her real mother about the other mother and her world. 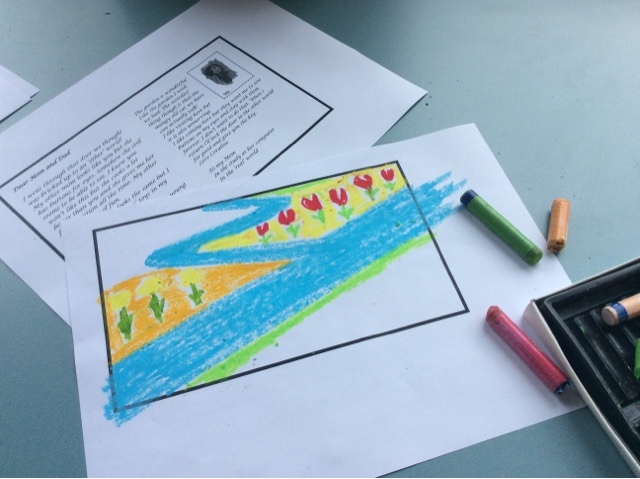 Draw the garden using oil pastels. 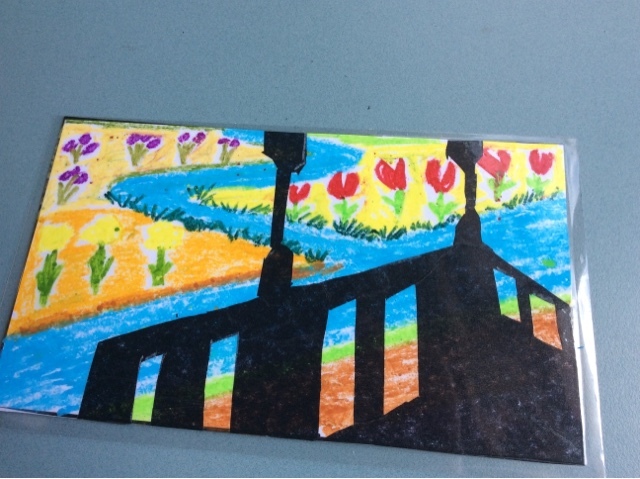 Use black card or tissue paper ( warning: very fiddly to cut) to make the shadow of the porch. Glue together picture and message and laminate. 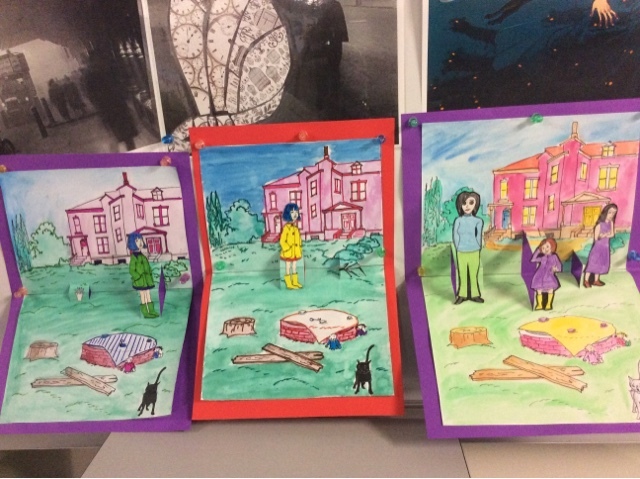 We also finished our pop up scenes for Coraline and they turned out well. 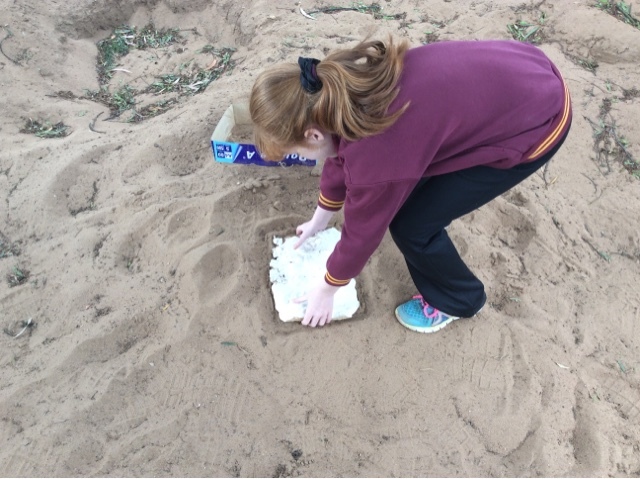 One of my students is reading about Big Foot so we made a plaster cast of a footprint in the sandpit. I was right about the strong winds bringing down a branch. 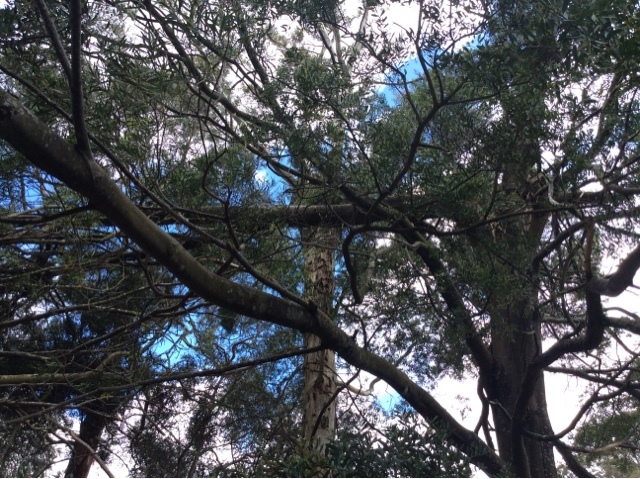 this big one out the back was snapped off but is resting snug in its tree. 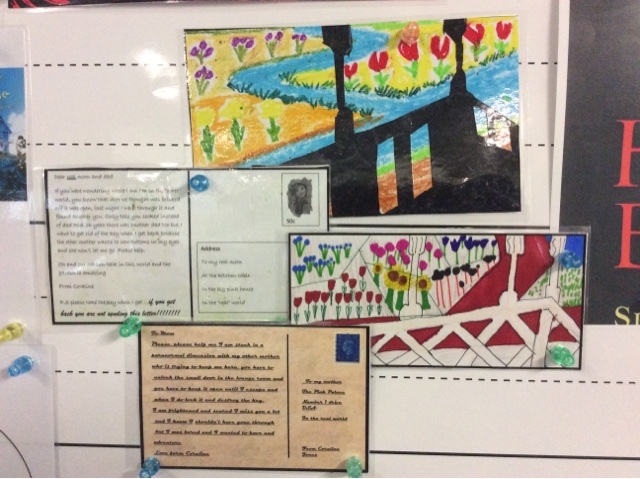 Coraline postcards finished and on display. Socrative: My all-time favorite app for formative assessment runs on everything. It cut my time teaching binary numbers from five to three days just because I didn't move forward until everyone "got it." Google Forms: Yes, you can create self-grading Google Forms for this. Kaizena: This tool integrates with just about any platform and was listed on my 15 Best Google Add-Ons. 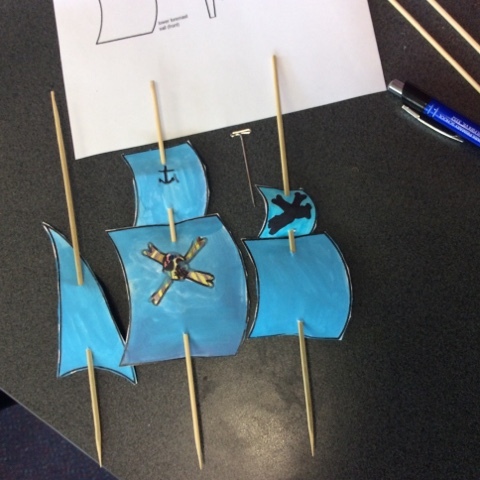 It really helps you provide rock-solid, multisensory feedback on student work. If you're going to share and interact with your students in the electronic and physical spaces (as you should), you must learn how to screencast. Screencastomatic: This is my go-to app. It's free, but I pay a few dollars for the pro service because I love it, it gives advanced editing features, and I can download to Dropbox. You can see that my YouTube tutorials are recorded with this. Camtasia: This app is high quality, and the price shows it. But I highly recommend Camtasia if you can afford it. Explain Everything: This app, available from iTunes and Google Play, remains a top tablet app in the U.S. It's perfect for math screencasting. Swivl: It's a robotic stand for your iPad, iPhone, or Droid. When you use the iOS app, Swivl will film and capture everything. It can also follow you without an app, so you could set another device on record and then just put it in the stand. Swivl lets you record speeches, or helps you evaluate your own teaching. Having a Swivl in your classroom changes everything. You just put the controller in your pocket or around your neck, and it follows and records you (mic in controller). I've been demoing this for two weeks and can focus on teaching rather than recording. Your school is bricks and clicks. You have a physical presence in your classroom and a digital podium through your content-sharing platform. You need a way to share your digital instruction, and kids need to know where to look. Haiku Learning: This is the full content management system that I'm trying to get our school to adopt. It's multiplatform and robust, which makes it a great fit for our BYOD environment. If you absolutely must do multiple choice (and if multiple choice is all you do, be warned that you're missing out), spend as little time as possible grading. These apps literally make it a snap. You create the quiz, students bubble in the answer, and you snap a picture on your mobile device, which is your own personal Scantron. If you're going to do multiple choice, at least give them immediate feedback. There's no excuse. All three of these apps -- Quick Key, Grade Ninja, and WISE -- are available on iTunes and Google Play, but there are more. Evernote: With a school subscription, you can share notes school-wide. It also does well recognizing handwritten and scanned notes. One Note: If you're a Microsoft shop and have admins supporting you, they can configure some very cool sharing abilities in this robust note-taking app -- the only synchronous note-taking app that works. Voicethread: This incredible tool helps younger students build their eportfolios. I love Brad Wilson's Write About This and Tell About This iOS apps for kids of all ages. Thinglink: Educators who work with special needs kids swear by what a great tool this is. It's web-based, but they also have apps. A must-use! Dropbox: If you shoot video on devices and need to get it onto your computers, Dropbox is exsential. I use it to make my classroom as paperless as possible. One Drive: This is the tool that goes with Word, Excel, and PowerPoint. I require my students to sign up for it over the summer. It's so great because they can open their documents in free versions of those Microsoft programs when they're away from home. Google Drive: This sync tool, underlying all of the Google suite, is a must for the collaborative classroom. We also use this as we edit our wevideoswith partners in Iowa. The infographic makers of choice these days include Easel.ly, Visual.ly, Infogr.am, and Glogster. Color Schemer: You may not have time to go into color wheels and such, but students need to know that certain colors go well together. I cut out all the time it takes to pick colors by teaching them to use this handy online app, and then teaching them to find and enter the hex number for colors in any app they use. I rarely assign one specific software program for presentations. These are my top six that I recommend to students. I expect them to know how to move their presentation slides between these programs. When they are doing a massive online presentation like they recently did for Gamifi-ed, some may create slides in Keynote and others in Haiku Deck, but they all have to export and insert their slides into the group Google Presentation file the day before we present. Haiku Deck: This is one of my favorite presentation programs for kids because of its tight integration with Creative Commons photos. They're easy to share and run -- wow! And there's a new version for the web. PowerPoint: Integrate with One Drive, and it's perfect for those kids who will edit on multiple devices. This tool is a plus in a PC-heavy environment. Keynote: Works with iCloud and picked by students who use Mac and iOS devices. 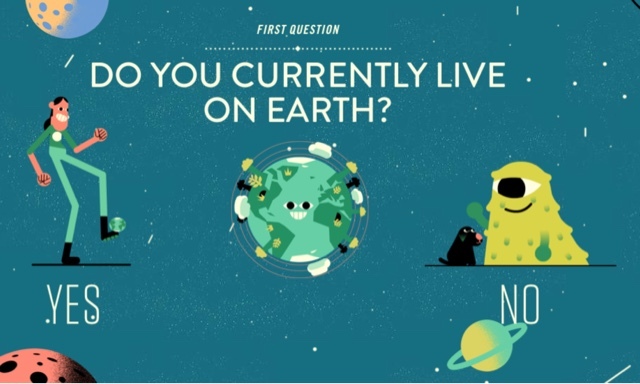 Prezi: This online presentation tool also has apps to create very interesting presentations that really start off as a mind map. Google Presentations: If we're presenting online as a class, this is our go-to app. It's the easiest way to edit together. Just know that once you're in presentation mode, students can't change slides. Slideshare: An excellent platform for sharing presentations and embedding them in the class website or wiki. A student without a personal blog is a student without a voice. Blogging is an essential form of 21st century communication that lets them interact with audience and peers. While I presently use Ning with my eighth graders, I've used all of these powerful blogging tools at one time or another. Edmodo: This gives you blogging, sharing, and assessment, plus the extensive libraries of assignments that you can join and share with other educators. Even if you don't use Edmodo with students, it's worth joining just to be part of the massively useful educator communities. If you're collaborating between classrooms, Edmodo is one of the easiest ways to do it. Kidblogs: This platform lies on top of the familiar, easy-to-use Blogger platform and is set up especially for schools. 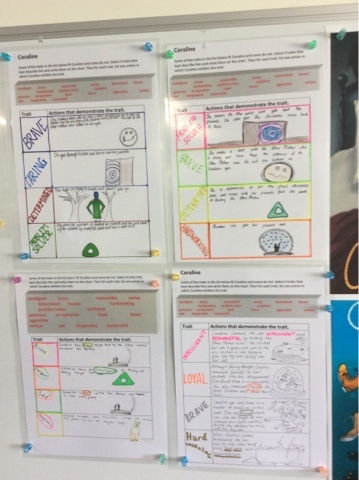 Edublogs: This blogging platform uses Wordpress in a powerful way, with each student linked to the teacher's blog and to each other. You have lots of privacy settings, and you get a very professional look. Ning: Ning looks like a social media site because it is. I have a private Ning network that I use to teach my students blogging just because it's so easy and flexible, and feels like Facebook. Wordpress: Many schools are setting up their own self-hosted Wordpress. It's easier than ever and gives you lots of flexibility for sharing. Dragon: They have an app on every platform, and some are free. I teach my students to dictate to Dragon and paste into their other apps. Microsoft Word: Microsoft's recent addition to the iPad has bumped Word back up on my list for collaborative writing. While you'll need a school-wide subscription to edit on the iPad, you can always use One Drive Online for iPad editing if necessary. Students will have to sign up for the free account at home, as Microsoft only lets three people per day sign up at one location. Google Docs/Drive: Students should know how to collaboratively edit. Make sure they understand the difference between commenting and chatting, though other collaborators won't see the chat, and it isn't saved. MentorMob: Think of educational playlists. Lots of Tech Coaches use MentorMob to share with staff. Symbaloo: I see this used heavily with elementary teachers who set it as the start screen for kids. It has large buttons that will take kids to websites. LiveBinders: When my son was in fourth grade, I used this to create a study platform for sharing material with other parents. Google Spreadsheets: See Annie Cushing's Must-Have Tools for the power of sharing links in this way. Diigo: Diigo is my must-use social bookmarking tool (I even use it to post to my blog). Students share research in groups (you don't need an email to sign up), and you can link it to blogs and other sources that automatically pull from this. Flipboard: While just on the iPad (for now), this platform is a great way to create a digital magazine of resources for your staff. These are just some of the many tools available for a BYOD Environment. As you're implementing BYOD, learn more about the SAMR model so that you an get past substitution into true redefinition of what you're doing in your classroom. What did I leave out? Share your must-have BYOD tools in the comments so that we can learn together. We made our mist pictures for Coraline today. 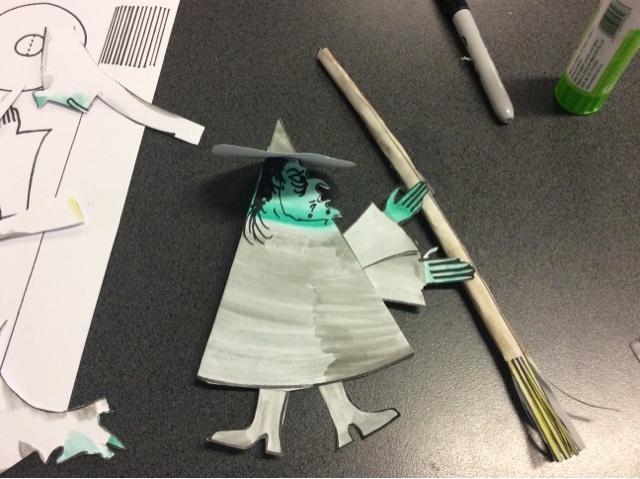 We used a paper craft 'Mayflower' as a stand in for a pirate ship for the Isobel Soto adventure reader series. 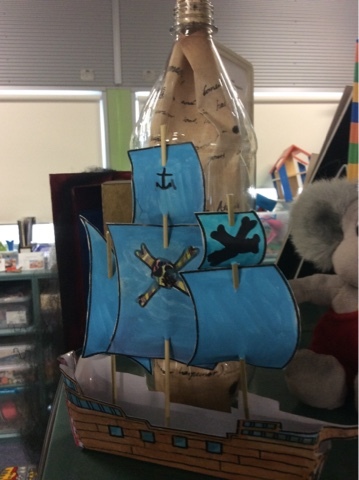 Pirate ship with a note in a bottle on display. Very blustery total fire ban day today. The CFA truck has already taken off this morning. I wouldn't be surprised if we lost another branch or two! 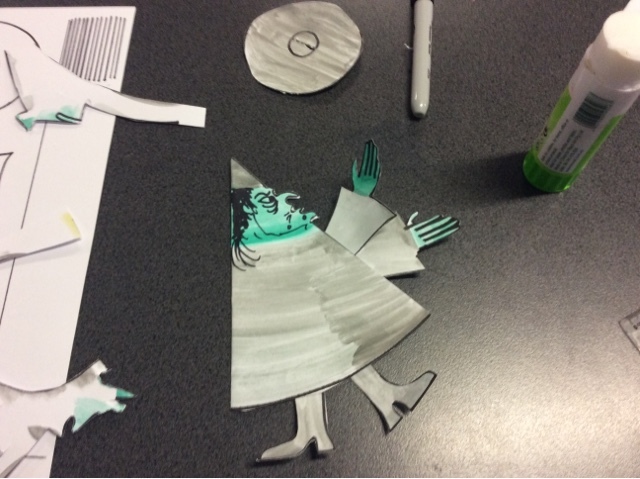 One of my grade 5s made a mini Coraline. Haven't had one of these for ages! Nose to the grindstone after a pupil-free day. WTF #3 Is it arrogance, stupidity or both? Principals should reject gifts!.....what gifts? This kid is going places.....not sure where?